All set to become a landmark in the field of medical care, Asian Institute of Medical Sciences has gone leaps and bounds to deliver its mission of bringing quality healthcare services for all. We are aligned with our guiding principle “Caring for what matters most”, which is the virtue by which every individual at Asian Institute of Medical Sciences works. The team of our expert medical professionals will constantly endeavour to provide accessible, affordable and best available healthcare services in India. Since its commencement, this hospital has continuously evolved in the field of medical science. Great ideologies have greater responsibilities and the goals in healthcare are to safeguard, encourage and at times cultivate the social fabric of the society as a whole. We at Asian Institute of Medical Sciences are earnestly and continuously striving our best to scale newer heights in the pursuit of excellence. Our hospital has become a name that spells assurance for the well-being of the patients. We are committed to make available to the public the benefits of the most modern and technological developments in the field of medical sciences which are a blend of technology along with impeccable patient care. The hospital has attained the highest standards of healthcare along with administrative efficiency, which has led to its accreditation from NABH and NABL. With a career in Medicine spanning over thirty years, I stand here grateful to the almighty, despite being from a humble background, I met a few gracious souls who guided me in my journey of life. My father solicited inspiration and taught me the value of discipline, perseverance and a regulated life. 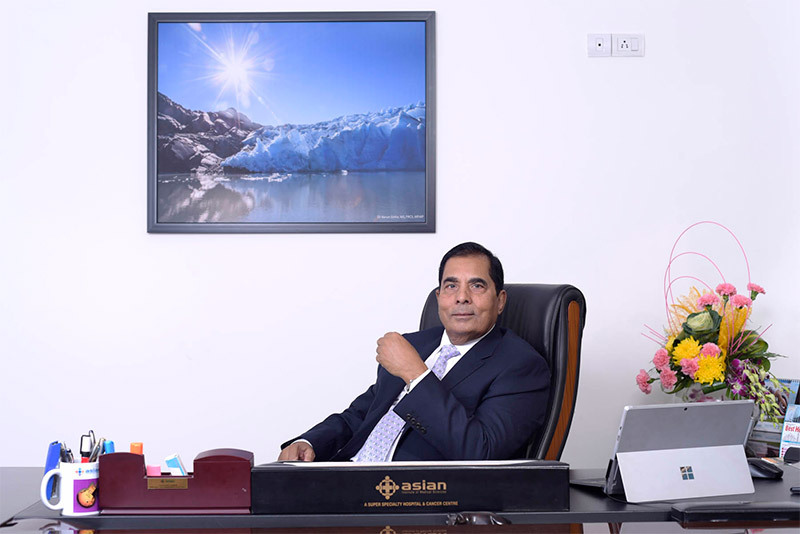 Asian Institute of Medical Sciences stringently conforms the healthcare regulations due to which the hospital is now an abode to foreign patients as well. My professor from APN Forest and colleague at the University of Edinburg taught me that surgery is an art. If you want to realize your dream then you just need to back it up with conviction and the tools would surely come around to fulfill it. Through our essence of high teamwork, we bring together all necessary disciplines and skills from many resources of our organization to serve our patients better and attempt to set a league of its own. Life is our greatest gift, where every moment is as new as it is special. Life is about living every second to the fullest and about making every day an experience to enjoy and cherish. We at Asian Institute of Medical Sciences cherish every moment spent in making your life healthier. We have a dream of delivering world-class medical care in Delhi/NCR and the whole of India with the best medical talent and we aim that our hospital leaves an indelible mark in the heart of every patient and their family members.